"The overall gift of the Holy Ghost truly is one of the greatest blessings available to members of the Church. We all need to stress—for ourselves and for those whom we teach—the vital connection with the gifts of the Holy Ghost. These gifts are vital at every stage of an individual's life and in every situation of life. 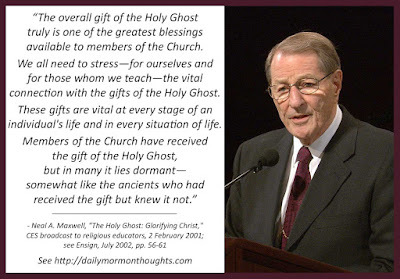 Members of the Church have received the gift of the Holy Ghost, but in many it lies dormant—somewhat like the ancients who had received the gift but knew it not (see 3 Ne. 9:20). "'The Holy Ghost ... quickens all the intellectual faculties, increases, enlarges, expands, and purifies all the natural passions and affections, and adapts them, by the gift of wisdom, to their lawful use. It inspires, develops, cultivates, and matures all the fine-toned sympathies, joys, tastes, kindred feelings, and affections of our nature' (Key to the Science of Theology , 61). "What a promise! No wonder we are instructed to 'seek ye ... the best gifts' and their attendant joys (D&C 46:8). We are not limited to just one gift, though that is the minimum each is given. Since the realization of so many blessings does lie latent, the Apostle Paul urged us to 'stir up the gift of God, which is in thee' (2 Tim. 1:6)." 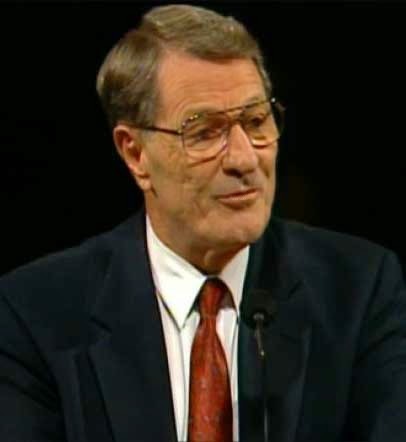 Elder Maxwell reminds us of the difference between "the overall gift of the Holy Ghost" and the diverse and varied "gifts of the Holy Ghost" that are available to those who seek them. Both play very important roles in our lives, and we should "stress... the vital importance" of obtaining and being blessed by those gifts! I've always loved Parley P. Pratt's beautiful, poetic description of the ways we can be influenced and blessed by the Holy Ghost in our lives. What a rich and profound gift it truly is! But it is up to us to "seek... the best gifts" that are offered through that endowment. We are counseled to seek earnestly, not casually... it requires effort, attention, and focus. But who can question the value of the result!